Along with formidable future weapons, super soldiers, armed drones of every size and autonomous robots executing lethal missions, the battlefield of tomorrow will also be driven by target identity and biometric data – you know, to stop terrorists. 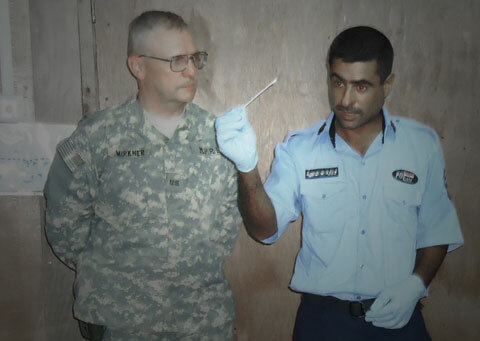 The United States’ most elite soldiers have been collecting DNA samples from suspected terrorists for years. But because analysis normally takes three weeks, it’s been a pretty useless chore. Now, however, U.S. Special Operations Command is testing a machine that can do it in 90 minutes. Get ready for advanced biometric warfare. The basic idea is not dissimilar to the way that Osama bin Laden’s body was ultimately identified. […] nothing beats DNA in terms of accuracy. Terrorists also leave trails of it everywhere they go. So the military is testing DNA identification in the field. This test is only a stepping stone, too. The devices in the field now are still pretty slow and hulking for what special ops soldiers could be carrying by 2020. In the next five years, the military hopes to develop a battery-operated DNA analysis device that’s the size of a cell phone and finds a match in seconds. The terrorist pretext is a bit of ruse, as the real goal seems to be total information collection on entire populations – whether friend or foe – in distant battlefields (and eventually at home, too), in order to better sort out who is who. Domestically, it could pinpoint who is wanted for crimes or payments and who is authorized to be there. The devices are the RapidHIT 200 from IntegenX, a California-based company, and the DNAscan from Massachusetts-based NetBIO. Both are about the size of a copier, but compared to an entire DNA lab, require far less manpower. A single operator can get quick results. “In the past, when we captured DNA, the guy would put it in an envelope, send it back to the States and two or three weeks later, he would get a result on who it was that he had. By then, he moved on to other missions and he had forgotten who the guy was,” said Fitz. The database for DNA is currently not as complete as they like – so it virtually guarantees an expansion of sample collection wherever it can be done. “Right now the database is a criminal database: U.S. people. We haven’t been collecting DNA, in part because it’s been a cumbersome and lengthy process to do that. There was no reason for the units to go out and collect DNA because the results were so slow,” Fitz said. The instant, advanced imaging tech has scanned the faces of one in six fighting-age men in Afghanistan, and a staggering one in four in Iraq. That’s millions and millions of eyes and faces, along with matching fingerprints. The military’s database means insurgents, prisoners, and other figures of note can be identified with near absolute certainty—making forged papers and trickery futile. But you can bet that where they are testing terrorist DNA to match against their watch lists, they’ll be collecting and testing it from ordinary citizens, as well – once it becomes acceptable to do. Once commercial databases hold the data, government agencies will, too. The age of biometric surveillance has been slowly creeping towards us for some time, but few foresaw teams of soldiers and police with rapid or instant field devices to make DNA, iris and fingerprint scanning an everyday part of patrols. It appears that if privacy isn’t dead now, it is on its deathbed.